I thought this deserved a thread of its own. Rather odd that we haven't had one until now, actually. He is, after all, probably the most legendary, most iconic and most cherished player in the history of AS Roma, and that is saying something. Il Capitano, Francesco Totti has officially renewed his contract with Roma, a deal which will see him remain as a player until June 30, 2014, before commencing a further five-year agreement as a director within the club. ROMA, 16 dicembre - Roma-Totti a vita. Ora ÃƒÂ¨ ufficiale la firma del capitano giallorosso sul nuovo contratto che lo legherÃƒÂ fino al termine della carriera ai colori che hanno segnato tutta la sua vita. Scadenza 2014, quando il numero 10 avrÃƒÂ 38 anni e sarÃƒÂ avviato a chiudere con il calcio giocato ma non con la Roma: dopo quella data, infatti, l'accordo messo nero su bianco di un quinquennio da dirigente per il simbolo e la bandiera della societÃƒÂ . ECCO IL COMUNICATO - LÃ¢â‚¬â„¢A.S. Roma S.p.A. ed il Capitano FRANCESCO TOTTI comunicano di aver raggiunto lÃ¢â‚¬â„¢accordo per il prolungamento del contratto economico per le prestazioni sportive, ad oggi in vigore e scadente al 30 giugno 2010, fino alla data del 30 giugno 2014. LÃ¢â‚¬â„¢accordo prevede il riconoscimento al Calciatore di un emolumento lordo pari a Ã¢â€šÂ¬ 8,9 milioni, per la stagione sportiva in corso, e di Ã¢â€šÂ¬ 8,6 milioni, per ciascuna delle quattro successive stagioni sportive di durata del contratto. In tale ambito, ÃƒÂ¨ stato altresÃƒÂ¬ definito tra A.S. Roma e Numberten Ã¢â‚¬â€œ societÃƒÂ licenziataria dei diritti di immagine del Calciatore - il prolungamento dellÃ¢â‚¬â„¢attuale accordo di licenza in esclusiva per lÃ¢â‚¬â„¢uso e lo sfruttamento dei diritti di immagine del Calciatore per specifici prodotti ufficiali a marchio A.S. Roma. Infine, lÃ¢â‚¬â„¢A.S. Roma e il Calciatore hanno inteso legare la propria storia, i propri successi sportivi e i propri progetti futuri impegnandosi a garantire a Francesco Totti la permanenza nellÃ¢â‚¬â„¢ambito dellÃ¢â‚¬â„¢Area tecnico-sportiva al termine della propria attivitÃƒÂ agonistica, perchÃƒÂ© lo stesso, entrando a far parte del Comitato Tecnico di Direzione, possa contribuire con le sue conoscenze e la sua esperienza alla crescita ed alla valorizzazione dellÃ¢â‚¬â„¢Area tecnica della SocietÃƒÂ . ^ Open letter from Francesco to the Roma fans. Perhaps one of our Italian speakers here would be kind enough to translate it. Grazie. Forza Er Pupone. May la magica have many more years of your brilliance. [size=84]Roma captain Francesco Totti has been voted the Best Italian Player in a poll conducted by La Gazzetta dello Sport. The 33-year-old talisman finished ahead of his Roma teammate Daniele De Rossi and Milan playmaker Andrea Pirlo. The pressure is now mounting on Totti to come out of international retirement and play for Italy at the World Cup. Fahad, oh you cynic! I'd like to think it's based on the premise of his pre injury form. But as I said elsewhere on the forum, Serie A is going through weakened spell just now. We know that, all too unfortunately! I know, but I don't really expect threads like this to be constantly used, but I see it more like a reference thread or if someone feels inspired to add something to it and in turn for others to check out and read the homage to Totti and add there own views. Thats why this thread, or the likes of the Ago thread or the De Rossi thread or the Financial thread can be worthwhile, its just a pity not many of us spared the time to contribute to them. I think, though, that the Transfer Rumours/Contract Extensions thread is not really working for us as its trying and failing to compete with the main thread, so we could perhaps lose that. Totti turns 34 today. Happy birthday, Il Capitano. ROMA, 27 settembre - Tanti auguri, capitano: alcuni tifosi ieri sera sono corsi sotto casa sua per festeggiarlo. Francesco Totti celebra oggi il compleanno: il capitano della Roma spegnerà 34 candeline e spera, dopo il successo contro l’Inter, di completare la festa battendo domani sera il Cluj centrando la prima vittoria nel girone di Champions. 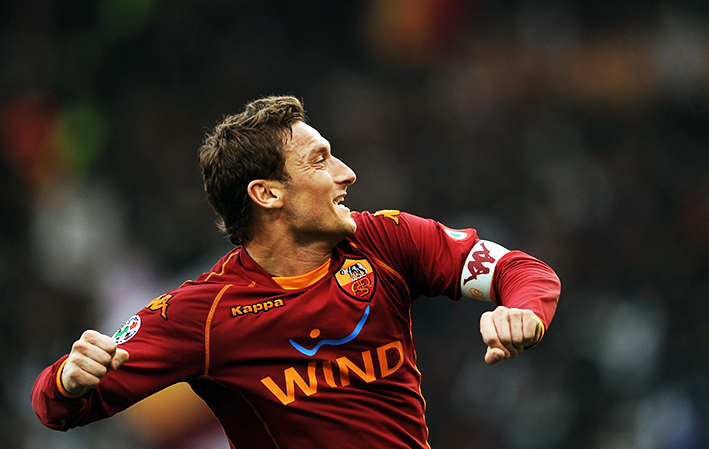 Roma hero Francesco Totti has won the 2010 Golden Foot award in recognition of his lengthy career with the Giallorossi. The Golden Foot, awarded in Monaco on an annual basis, goes to a player over the age of 29 and who is still playing. According to the criteria laid out, the winner must have "great technical skills, uprightness and fair play, popularity and international reputation with a successful career and credible personal achievements with club and country." Ten nominees are chosen by a panel of international journalists, and supporters from across the globe have opted to recognise Totti's achievements ahead of fellow nominees David Beckham, Gianluigi Buffon, Didier Drogba, Samuel Eto'o, Steven Gerrard, Ryan Giggs, Carles Puyol, Raul and Clarence Seedorf. Totti is an idol of the Roma support thanks to his wonderful performances since his emergence from the club's youth ranks in 1993. His finest hour came in 2001 when, under the tutelage of Fabio Capello, Roma recorded a rare Serie A victory. Though initially emerging as a playmaker, Totti was shifted into a lone attacker's role under coach Luciano Spalletti and was the top scorer in European football in 2006-07 when accumulating 26 goals in Serie A. • from Corriere dello Sport. Ed, I had only read the "Football Italia" report on this and was wondering if it was worth posting. I'm glad I didn't because I hadn't seen your version until now and needless to say, it puts the Football Italia piece to shame! 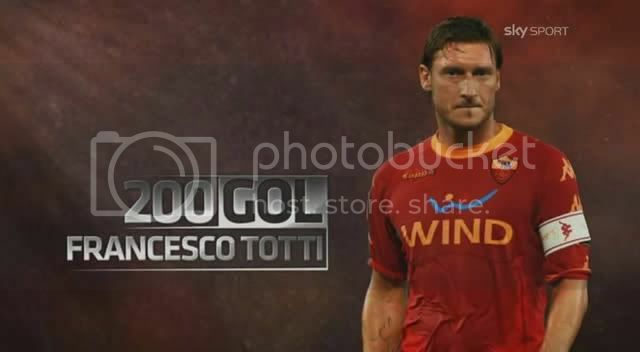 A '200 Gol di Francesco Totti' video from Sky Sport Italia has been added to the , well worth keeping. Seriously is a great player and well done to him for 225th goal the other weekend! And I've heard that he wants to keep playing to his 40 and I think he should! Go Totti! The only player with 10+ goals and 10+ assists in Italy, England, Germany and Spain? could mount a pretty serious case for a 6th Italian Player of the Year award. Good to open this thread. He is a great player...hope he gets Piola's record. Francesco Totti's first season in Serie A was 1992/93 and the blond-haired boy from Porta Metronia made his league debut at Brescia's Stadio Rigamonti on March 28, 1993. With the Giallorossi leading 2-0 and the three points already in the bag, Vujadin Boškov decided to bring on a promising Primavera kid in the 87th minute. A 16-year-old who would never have dreamed of making his first-team debut that afternoon. Totti took over from Ruggiero Rizzitelli and stepped into Roma history. He later made his second league appearance against Ancona. Totti played eight games this year without getting on the score sheet. But his talent and ability were there for all to see, most notably in the second derby meeting of the season, Lazio v Roma. Carlo Mazzone threw the youngster on in a bid to get the team back on level terms and Francesco took to the task enthusiastically, spreading havoc among the hosts' backline and even earned a penalty. Unfortunately Giuseppe Giannini missed from the spot. The future Giallorossi captain scored his first Serie A goal on September 4, 1994, in the 29th minute of the season's curtain-opener between Roma and Foggia: a left-footed strike that proved unstoppable for Francesco Mancini. It was to be the first in a long series. He went on to make 21 appearances that campaign, hitting four goals. Totti, who hadn't yet turned 20 at the time, became an increasingly important part of the first team. He still wasn't scoring many goals (only two), but he established himself as a first-team regular, making 28 appearances. This season was the first time in Italian football that players got to choose their jersey numbers and stick with them for the entire season: Francesco chose number 20. Carlos Bianchi took over at Roma. The Argentine tactician had been a very successful coach back in his homeland but had yet to make a name for himself in Europe. He immediately described Totti as "a normal player", and even contemplated selling him to Sampdoria during the January transfer window. But Francesco showed exactly what he was made of and before the season had ended it was the coach who was packing his bags and on his way out of the club. 26 appearances and 5 goals wearing jersey number 17. President Sensi's decision to bring in Zeman as coach marked the turning point in the footballing career of Totti. Zeman immediately gave the player from Porta Metronia a lot more responsibility, handing him the No.10 shirt and fielding him on the left of his three-man attack. For the first time in his career, Totti's goal tally for the season reached double figures: 13 goals in 30 appearances. Totti continued to flourish under Zeman’s wing and scale new heights. The No.10 was now regularly dominating games and earned his first Italy call-up. Azzurri head coach Dino Zoff gave him his international debut on October 10, 1998 as Italy beat Switzerland 2-0. Totti also became the club captain and reached double figures for the season, scoring 12 goals in 31 games. Fabio Capello took over as the new Giallorossi coach and was immediately taken by Totti’s special talent. Speaking to traditional Italian football program Domenica Sportiva after Fiorentina 1-3 Roma, the future England manager described Francesco as “the new [Gianni] Rivera”. The captain made 27 appearances, netting seven times. Totti went into the season on a high after playing a starring role for Italy at Euro 2000, receiving worldwide plaudits for his goals, top-quality performances and, most memorably, for his penalty conversion in the semi-final shootout against the Netherlands (a trademark “spoon” chip). The captain led the Giallorossi’s title charge, chalking up 13 goals in 30 games as Roma claimed the Scudetto. Now sporting the Scudetto on his jersey, Francesco was running on all cylinders. However, he was hampered by an injury towards the end of the season. Roma were in the hunt for a championship repeat only to see it go up in smoke in the final game of the season. 24 appearances and 8 goals. The consolation prize was the first Italian Super Cup in the club’s history. Roma failed to shine in the league, which came down to their own mistakes, as well as a few from the referees (mistakes that would later be acknowledged by the referee designators). Roma finished the season in 8th place, but Totti set a personal record in the Serie A with 14 goals in 24 appearances. The signings of Chivu and Mancini and the presence of heavyweights like Samuel, Emerson, Cassano and, above all, Totti took Roma back towards the top of the standings. Capello chose a fantasy pair in attack in Totti & Cassano. And with 20 goals in 31 appearances Francesco undoubtedly played a leading role. A season disrupted by Capello's departure and Cesare Prandelli’s appointment, before the latter then left for personal reasons. Four coaches came and went over the course of a season, in the shape of Prandelli, Rudi Völler, Luigi Delneri and Bruno Conti. The team battled to stay up but Totti didn't lose his eye for goal, hitting 12 in 29 matches. Luciano Spalletti came in and moved Totti from a free role into the lone striker in a 4-2-3-1 system. It was also the season Roma won a record 11 straight league games, and Totti sustained an injury to his left ankle (19 February), before making a rapid recovery in time for Germany 2006. He came home as a world champion. One heck of a campaign for Totti: 15 goals from 24 appearances. Spalletti's Roma side were thrilling to watch both in Italy (second) and Europe (Champions League quarter-finalists) and Totti was the key man. His 26 goals in 35 matches earned him the title of top scorer in Serie A, winner of the European Golden Shoe and he also bagged his first Coppa Italia. Roma began the year by winning the Italian Super Cup and then came within a whisker of claiming the Scudetto. This was a fantastic team with Totti in scintillating form (14 goals in 25 appearances). A knee injury put him out of action from April onwards but he was at the Stadio Olimpico to raise the Giallorossi’s second successive Coppa Italia trophy. Not one of the best seasons but the dream was to reach the Champions League final being held at the Olimpico. Spalletti’s Roma believed they could do it and they gave everything in the last 16 tie against Arsenal, Totti playing half-injured, but it wasn’t enough. The dream ended in a penalty shootout. 24 Serie A games, 13 goals. Spalletti left the club two matches into the campaign and Claudio Ranieri took over. After a slow start, Roma started playing some great football and put together a magnificent run of results, going 24 games unbeaten. At one stage it even looked as if they could force themselves into the running for the title but they petered out towards the end. Totti played a starring role once again: 23 appearances and 14 goals. A tough season with up and down results which eventually forced Claudio Ranieri into resigning. Montella replaced him and tried to secure Champions League football but it was too late. The only pleasure came from the derby (five straight wins including the ones from the previous year) and Totti, who hit 15 goals in 32 games. Besides a new coach (Luis Enrique), the club also saw new ownership: James Pallotta’s American consortium took control of the side from the capital. It marked the beginning of a new era for Totti and Co. The skipper struck eight times in 27 matches. Yet another record-breaking season for Totti: his effort against Parma (his 11th goal against the side from Emilia) saw him move past Nordahl and into second place on the all-time leading scorers charts in the Italian top flight. And the best (Piola) is still to come.